Classically trained starting at the young age of 7 on guitar, Neal Walter really knows his stuff. He's mastered all kinds of styles like jazz, country, blues, and rock guitar. As a session guitarist and gifted songwriter, he has been a semi-finalist in the Grammy Songwriting Contest, and records with a variety of artists and performers. On Guitar Tricks, Neal's lessons range from surf, metal, rock, and blues. 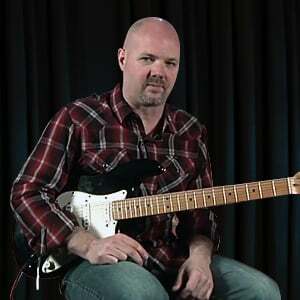 Guitar Tricks Channel host Neal Walter loves metal guitar and the sonic intersection point between metal and classic rock. In these lessons Neal will teach you some of his favorite topics from 80s metal to more modern drop D sounds. Enjoy watching these episodes from all our visits to NAMM! Rock on! "Hot Child in the City" was made famous by glam rocker Nick Gilder in the 1970's. In this series of lessons we'll put several things under the microscope: the harmonics and delay, the verses, guitar hook lick in the choruses, the bridge, and how to use space in the music to your advantage. Then we'll top things of with a play-along. In this set of lessons, Neal Walter will teach you the 80's classic "Treat Me Right" as made famous by Pat Benatar. This rockin' guitar song is built around a driving 12/8 triplet feel. We'll take you through the verse, the chorus, the accents and rhythms, the screamin' solo, and top it all off with a playalong.